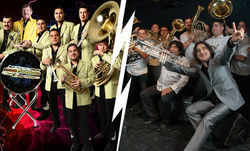 Two super heavyweight enormous brass bands go head to head, side by side, mano a mano, on the same stage to decide whether it's Mexico or the Balkans that can blow the hardest! Tickets: £15.50 - £24 - on sale now from the Barbican, Ticketmaster and SEE Tickets. 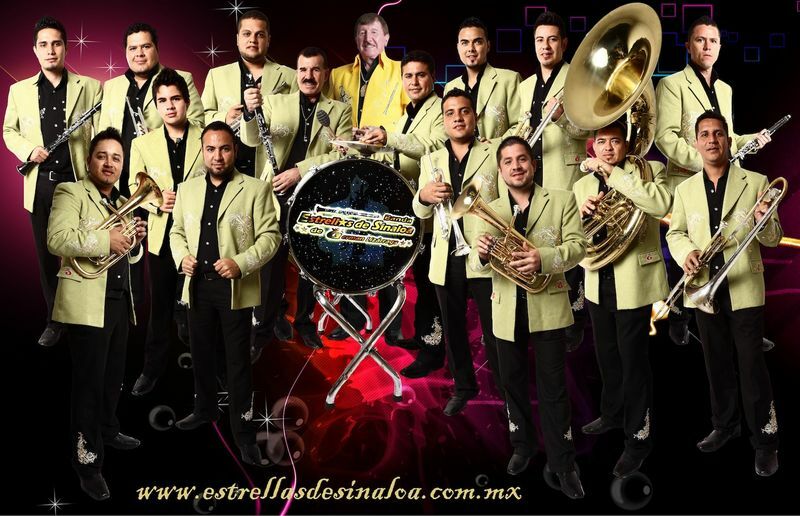 Whilst in the East father and son band leaders Boban and Marko Markovic from Serbia have become the gyspy brass kings of the Balkans, in the West, Germán, leader of the Lizárraga dynasty of Banda musicians from Northern Mexico has blown his way to ascendancy with the Estrellas de Sinaloa. London, as ever, is the place where these things are laid to rest. 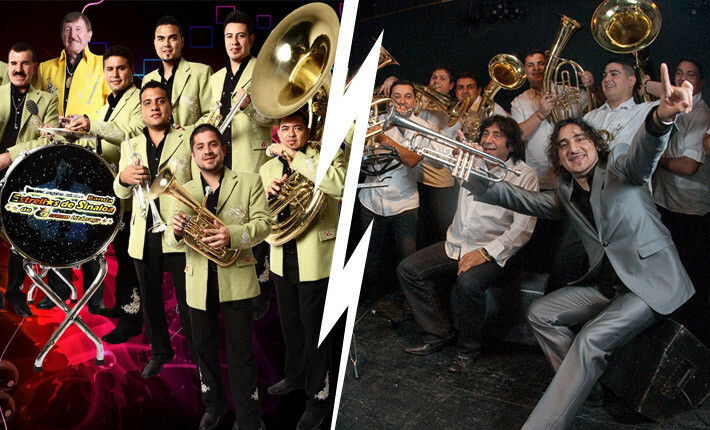 Mexico vs. Balkans Brass Band Battle is a World premiere title decider, produced by La Linea, the London Latin Music Festival, in association with the Barbican. 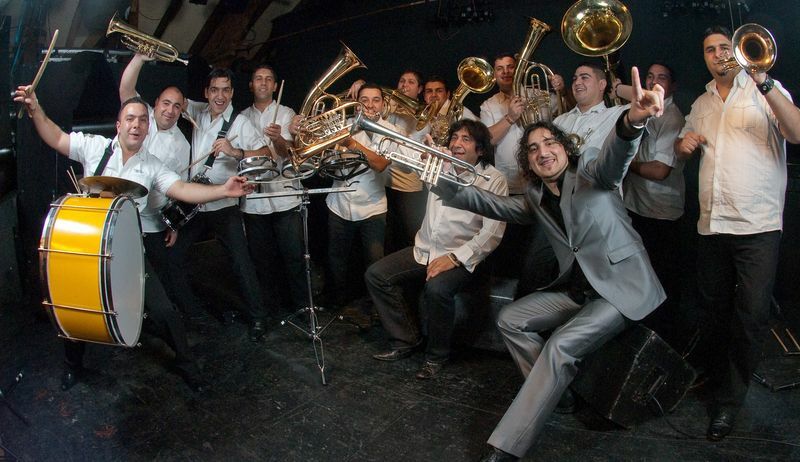 Thirty musicians on one stage, a clash of Mexican banda and Serbian gypsy brass, and a white-hot-brass-knuckle ride not to be missed with the audience the only guaranteed winner. Get ready to raise a glass of Slivovitz or Tequila to the gladiators. The quintessential Balkan brass band from Vladicin Han, in Southern Serbia, has once again captured the mantle of 'Leading Band in Serbia', a title for which they have been crowned many times since the late 1980s. Their music, performed by a thirteen-piece strong orchestra, is wholly defined by their own gypsy lineage, whilst giving a knowing nod towards other musical and cultural backgrounds closely related to Romani traditions. Boban and his Orchestra have won all of the most prestigious accolades available to players in Serbia: ‘Trumpet Maestro’ (2 times), ‘Golden Trumpet’, ‘First Trumpet’, ‘The Best Orchestra’, ‘ The Best Concert’. Marko, Boban's son and now the band’s primary soloist and arranger, has collaborated heavily, as both as a soloist and co-arranger, with Shantel on his well-received new album 'Disco Partizani' and has performed with the Bucovina Orchestra. They return to the Barbican after their spectacular 2009 concert in the Hall and a double bill with the legendary Taraf de Haidouks at Hackney Empire in 2010. Germán Lizárraga's career spans over 60 years and 194 records. He started playing very young in Banda El Recodo, founded by his father Don Cruz Lizárraga in his hometown of Sinaloa. That is how his music reached the United States and Europe for the first time and the band became the 'mother of all brass bands'. In his quest to revolutionise brass band music, Germán decided to split from Banda el Recodo to pioneer a new concept called 'Sonido Turbo', using harmonics and clarinets in the rhythmic section - and that's how the Germán Lizárraga y su Banda Estrellas de Sinaloa was born. Combining the traditional style with the melodies and the classical clarinet of his 'Sonido Turbo', Germán and his sixteen talented musicians have toured the Mexican Republic at large, in addition to European countries such as Spain. There may be over 6,500 miles between Mexico and the Balkans but musically this distance that has been shortened over the years. In fifties Yugoslavia, when relations with the Soviet Union were broken, it was - somewhat bizarrely - Mexico that was looked to for importing entertainment, starting with films. The Mexican films featured musica ranchera thus making it very popular in Yugoslavia. Inviting these musicians to come and perform would have been difficult, so many local Yugoslavian musicians started making Mexican music - and even dressing like Mexicans. Unconnected to the love for Mexican music in the former Yugoslavia, is that of Balkan music in Mexico. Balkan music is getting bigger and bigger in Mexico right now, local Mexican bands playing Balkan music at events across the country. 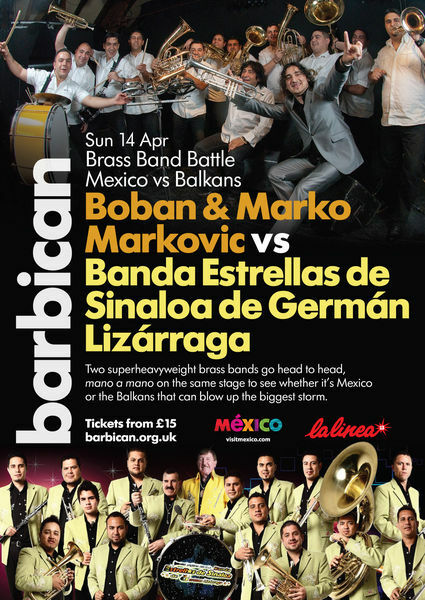 With this culture exchange taking place it will be fascinating to witness the historical Brass Band Battle of Mexico vs. the Balkans at London's Barbican on 14 April. This event is part of LA LINEA.